Utilizing cutting-edge electromagnetic locator technology, Diakont delivers industry-leading pipeline location mapping services. Diakont’s pipeline mapping services provide XYZ positional data on the precise locations of pipelines in latitude, longitude, and elevation. This service is invaluable for facilities looking to verify existing drawings and to fill in data gaps for newly acquired assets. With Diakont’s above-ground geospatial and GPS mapping technology, we provide 3D drawings of piping systems overlaid on top of satellite images, eliminating the need for potentially dangerous excavations. 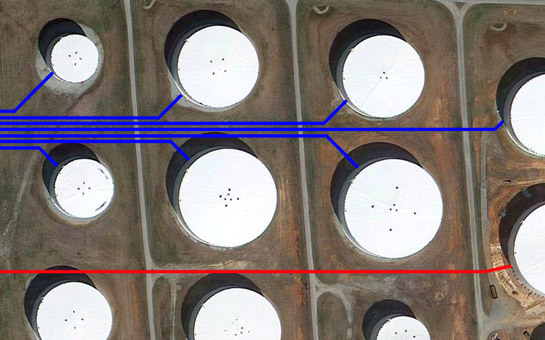 This highly accurate pipeline mapping informs pipeline operators of the exact location of piping systems based on GPS coordinates and relative position compared to physical landmarks such as storage tanks, valves, etc. The 3D drawings also provide the depth of piping systems—an essential data set when it comes to avoiding catastrophes during excavation for other functions or new equipment installations. Diakont’s expert teams of project managers, engineers and field technicians are highly trained for facilities work and have successfully completed projects for over 50 facilities and stations. Diakont also provides comprehensive pipeline inspection services of buried piping to ensure that facilities continue to operate safely and efficiently.